Up for auction is a Marvel Legends Captain America from the Winter Soldier. Starting bid is $18. Shipping is free. U.S. only. PayPal only. Used Hasbro Marvel Legends Winter Soldier 6” Action Figure only. Incomplete. No Mandroid Baf Part. See photos for condition. No box. No returns. No international shipping. MARVEL LEGENDS WINTER SOLDIER ACTION FIGURE. Condition is Used. (Look at pictures) Sold æ is! Ready to ship! Great to add to your collection!! Payment must be made within 3 days of ending listing ! Serious buyers only !!! please contact for any questions you may have,PayPal only! Marvel Legends Hasbro Winter Soldier Bucky From 2-pack Black Widow. Condition is Used. Shipped with USPS Priority Mail. Figure is complete, authentic, and in excellent shape. Minor shelf wear. Displayed by an adult collector in a smoke free house. See pics for details. Ask me anything. Thanks for looking. Figure is used but in pretty good shape. What you see is what you get, thanks! Grey black widow. This is for a marvel legends. Never played. No broken parts. Mandroid Series. WINTER SOLDIER. Marvel Legends. 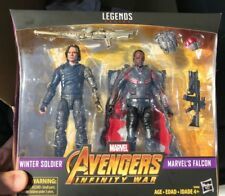 Marvel Legends Series AVENGERS INFINITY WAR Winter Soldier and Marvel's Falcon. Condition is New. Shipped with USPS Priority Mail. This auction is for a Marvel Legends, Avengers Infinity War, Winter Soldier figure. Figure is about 6 inches tall. Pulled from packaging, never pulled from plastic tray. Paypal payment due within 4 days of notification. After the fourth day, if there is no payment, then item will be lost. I do combo shipping and handling. New and sealed! Marvel Legends - Falcon and Winter Soldier! Winter Soldier. Accessories: All accessories displayed in the picture(s) are included. Marvel Legends Daredevil, Antman, Falcon, Winter Soldier, & Human Torch. Marvel Legends Daredevil (walgreens) Antman (Walgreens), Falcon (Walmart), Winter Soldier (Walmart), & Human Torch (Ronan Wave). Condition is New. NEVER OPENED. HASBRO MARVEL LEGENDS WINTER SOLDIER CAPTAIN AMERICA MANDROID BAF WAVE 6” 2014. Condition is Used. Shipped with USPS First Class Package. Marvel Legends Winter Soldier Captain America. Condition is Used. Shipped with USPS First Class Package. ~Included his shield only, other accessories and baf parts is not included. ~What you see what you get in the picture. ~Rare and hard to find! Get it before is gone! Marvel Legends Black Widow HEAD Infinity War Winter Soldier Endgame ! Hi, Your looking at a Custom Marvel Legends Winter Soldier/ Captain America. Condition is Used. Shipped with USPS Priority Mail, Thank you for looking. A great addition to any collection or for play! AVENGERS INFINITY WAR. WINTER SOLDIER. MARVEL LEGENDS. Marvel Legends: Mandroid Series. Winter Soldier. Year Released: 2013. A great addition to anyone's collection! Includes alien sniper rifle accessory. HASBRO MARVEL LEGENDS CAPTAIN AMERICA WINTER SOLDIER CIVIL WAR ALTERNATE HANDS. Condition is Used. Shipped with USPS First Class Package. Figure As Is In Picture. CAPTAIN AMERICA w Head Loose Hasbro Marvel Legends (Avengers, Winter Soldier). Condition is Used. Shipped with USPS Priority Mail. This item is very clean and has been examined thoroughly. 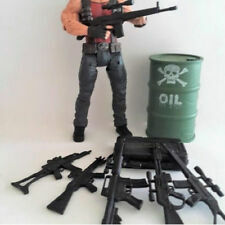 Includes: Complete figure with rifle and alternate head. Size: 6", 1:12 scale. Condition: Excellent quality with tight joints. 9/10 100% guaranteed to be received as listed. ~Included all accessories show in the pictures, baf part is not included. ~What you see what you get in the picture. ~Rare and hard to find! Get it before is gone! NEW 2013 Hasbro Marvel Legends Captain America Winter Soldier Action Figure. Condition is New. Shipped with USPS Priority Mail. BLACK WIDOW. WINTER SOLDIER. MARVEL LEGENDS. Item has been kept in a display case until now. Publishers reserve the right to change or alter covers. Derby City Comics & Toys has got what you need! VARIANT COVERS! Baron Zemo Mandroid series complete and is in great shape. (sorry no BAF piece included).